The California Warriors 2019 Team is comprised of graduating Seniors who are preparing to play collegiate baseball. The goal of this team is for the student athletes to experience playing against collegiate competition. In addition to competing in tournaments and games, they will be practicing on Wednesdays at Tamalpais HS to fine-tune their skills as they prepare to play college baseball. If you are interested in playing for future California Warriors teams, fill out the Player Inquiry Form. Travel information such as hotel room bookings will be added to this page as soon as we confirm details. These are the tournaments that have been scheduled so far. We will be staying at Ramada Carlsbad By The Sea and have a room block set aside for us at the group rate. Using the link below, input File #: 51707 and Password: supnipas, then click “Submit” and “Reserve Individual Room” to reserve your room. Book rooms here. Steve Reinertsen has served as the Branson pitching coach for the last seven years and has served as coach of the Branson cross country team since 1985. Steve has brought a wealth of knowledge and experience to California Warriors players for the past four years and will continue serving as the assistant coach for the 2018 Elite team this summer. 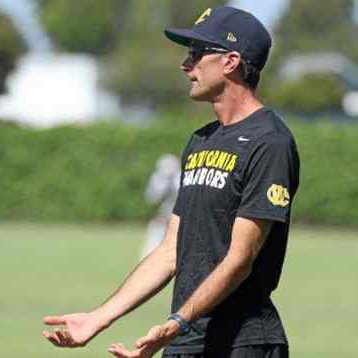 Steve is also the father of two former California Warriors, Sam and Henrik Reinertsen, who both play Division I baseball at Davidson and the University of the Pacific, respectively. Alec Ritch, a California Warriors player from 2015-2018, is returning to the organization after his freshman year at Middlebury College. The outfielder, who graduated from Branson, will be making his coaching debut with the CaliWarriors as an Assistant Coach on the 2019 Team. Nick Roth played for the California Warriors from 2015-2017 and will be joining Steve Reinertsen and Alec Ritch for his first summer of coaching with the CaliWarriors. The Drake graduate is in his second year as a member of the College of Marin pitching staff. The calendar will be continuously updated as games and tournaments are confirmed. Copyright © 2018 First Base Foundation-California Warriors. Website by Sporty Tech Services.